I am 27 years old! I actually can't believe it. It feels so weird for some reason like I actually feel like I'm an adult now. I kind of feel like I need to have a baby and get married! That's how old I feel now lool. I think I want to spend this year just really working on me and my career. The way I see it is, I'll be thirty in a few years (oh Lord help me) and who knows how long I have to focus on me and really go for it? Everything is really falling into place now and I just want to keep pushing. For my birthday I went in! I really didn't know what to do and then I ended up doing everything. I went to Jimmy's World Kitchen, which is a buffet with food from around the world. Zarah and I ate so much food that by the time we got to our third plate, even looking at the food was making me sick. Then we went to the Harry Potter Studios, which was amazing!! I got to push the door that leads to the Great Hall. 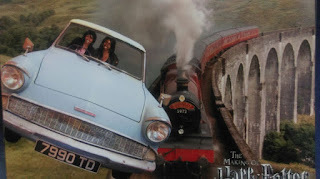 All the kids hated me hehe and try Butterbeer which tasted a bit weird but once it melted with the cream, it made an epic milkshake. It kind of tastes like butterscotch and cream soda. Then on my actual birthday, me and my sister went to watch Fantastic 4, which wasn't better than the original and then I saw Matilda the Musical. Those kids left me speechless. Our weather has been a bit sketchy but thankfully on my bday it was shining bright, even the tube strike couldn't kill my vibe. Then the next day (I know) had a dinner at Joe's Southern Kitchen which is basically southern food - friend chicken, mac and cheese etc but it was sooooo good. That is definitely the new spot!! Zarah gave me a massive red velvet cake. Oh my gosh, it was beautiful. The best thing I have ever seen. Then to top it all off, the Prophet spoke to me again at the Encounter Conference! He told me he had some publishing contacts for me. Feeling like a G.
There was a point where I felt like my books weren't really going the way I wanted them too. I'm still waiting on a secure deal. I feel like I've been offered many and yet haven't signed any doted lines. It got to the point where I was questioning myself and my talent and was thinking is this writer life for me? And then it hit me. I am so bloody lucky. I live in a time where I have so much control over my books and there are loads of publishing options. I wasn't stuck, I just wasn't looking at my options. So I have decided I am giving Emily Knight till the end of the year to secure a deal or I will do it myself for next year. Feeling sorry for myself doesn't sit well with me. Plus I have my new dance story, which I got critiqued and got strong feedback for. I think that book will do really well. Magic Mike XXL. I know exactly what I need for my hen night. Channing. TMF LIVE 2015 was a huge success!! Thank God but I don't want to see another running order until next year. The Author School is doing really well! Our launch party was so busy, it was incredible. My speech went well and I spoke to the Sunday Mirror. Holla!! We have made partnerships with different companies, got guest speakers from an editor to a blogger and we was featured and recommeded in The Daily Mirror and Love Sunday magazine!! We now have tickets on event brite as well as on our site. Check out our amazing website The Author School and see what we have been up to. If you want help with editors, publishers, agents, marketing etc then come to our class on September 26th at The Bridge. Tickets are very limited so I wouldn't wait around. Check out this FLASH SALE with 60% off tickets! Only for a few days, so get while you can. Here is my interview with Out The Box UK that I mentioned in my last blog. It is probably my most honest interview to date. I am obsessed with bubble tea. Had a great time at Bournemouth beach yesterday. Considering it is in the UK, the beach is pretty nice. I thought it would be all rocky with brown water but the complete opposite. Got to bond with Jamilah and Milani and the salt water did my foot good, as I had banged it the other day and it was bruised. Was a long journey but would defo do again. I kept getting deliveries for a lady called Sophie Ward for next door but it said on the envelope that is was for the Green Carnation Prize. So I googled Sophie and it turned out she is an actress. I sent an email to the prize people and told them I had her books but there was no response so in the end I gave it back to postage. Then I got another package and even though I said she never got the other one, they were convinced, for some reason that she would get this one. Again, it wasn't picked up, then I realised, I could just tweet her. I did and she said she had the kindle copies so I could keep the books. All seven of them. It was a good day. Before I shoot of to Belgium, I need to tell you about the best thing happened to me. Literally made my year. 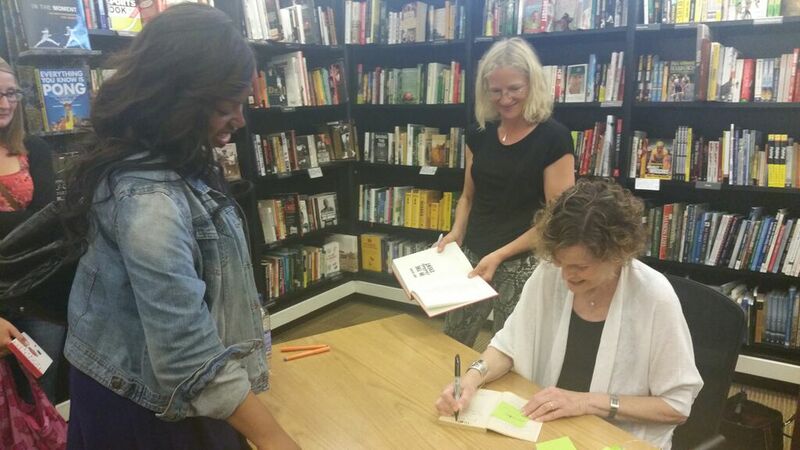 I met JUDY BLUME!!!! 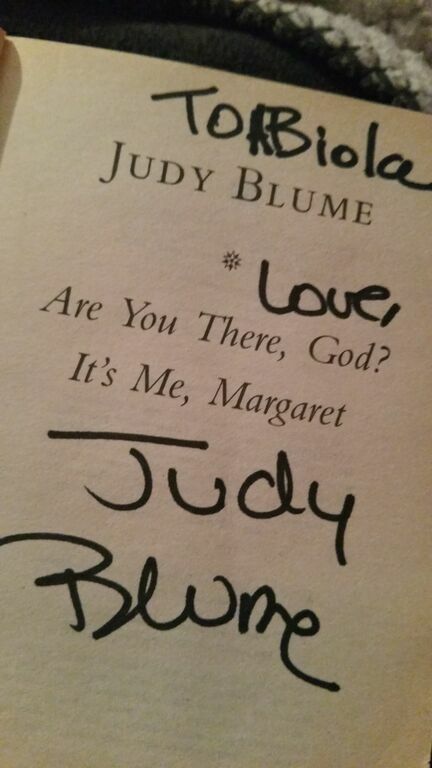 Judy is my fav author in life and I met her at Waterstones. She literally blows my mind. 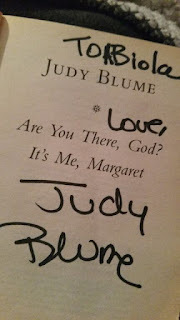 It was all because of her stories like 'Are you there God, it's me Margaret' that made me want to write AND she signed my Margaret book!!!! AAAHHH!! !